The Voyager Breast Secretary Wallet is made from hand stained vegetable re-tanned Buffalo leather and features a sophisticated design with a rectangular shape. The Voyager Breast Secretary Wallet is hand crafted from hand stained vegetable-tanned Buffalo Leather and features a slim design with 16 pockets to hold your credit cards, bank cards, driver's license, membership cards or photo ID, cash, and checkbook. 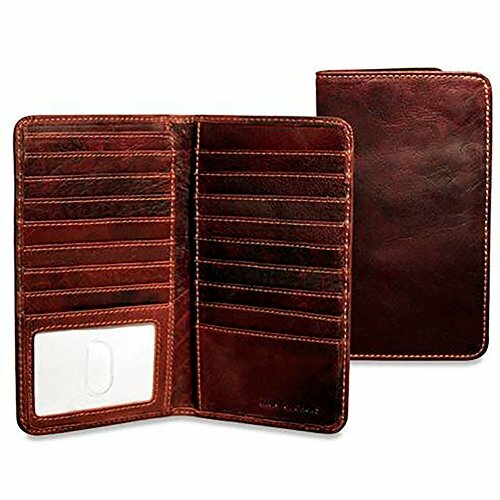 This wallet features rounded corners to resist breakage and a comfortable fit inside jacket pockets. Dimensions: 4.1"(L) x 7"(H). Weight: 3.5 oz.